If you're looking for an epic and exciting sci-fi setting filled with awful, often game breaking bugs – and you didn't already get your fill with Defiance – then Star Trek: The Video Game should be right up your alley. Not even the palpable hype from the impending movie, as well as the stellar cast, can save this generic action adventure title from setting phasers to glum. It's a bit of a shame, too, as this is a game that shows some signs of promise, and occassionally comes close to serving its revered source material well. The inclusion of the movie's actual actors is a rare treat for a tie-in, and it helps immensely with immersion. Furthermore, there are plenty of nods to the franchise that the title is based upon, including collectible Tribbles. You'll even be facing off against the Gorn in a well written plot that sees the Federation attacked by this menacing enemy. However, it's all downhill from there. 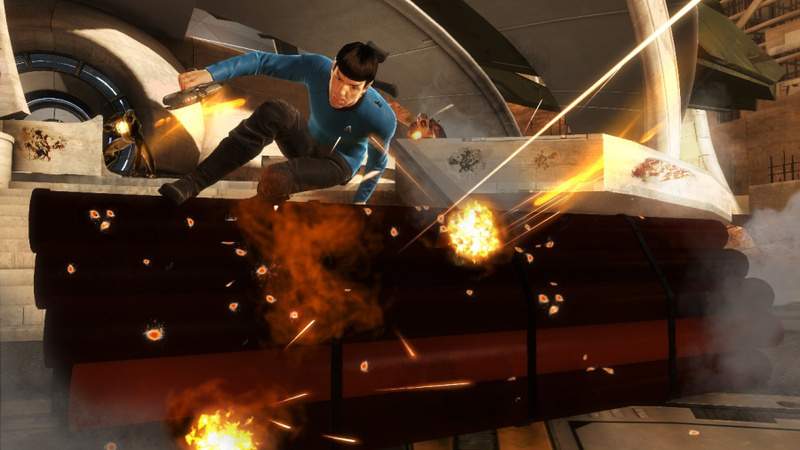 Assuming the role of either Kirk or Spock – with the computer or a friend filling the shoes of the other – you'll be prompted to travel from New Vulcan to the Gorn homeworld, stopping off at starships and space stations along the way, and battling against the lizard troublemakers. With your trusty phaser and tricorter to hand, you'll need to explore the title's environments while scanning for enemies, collectibles, and hazards, solving puzzles along the way. 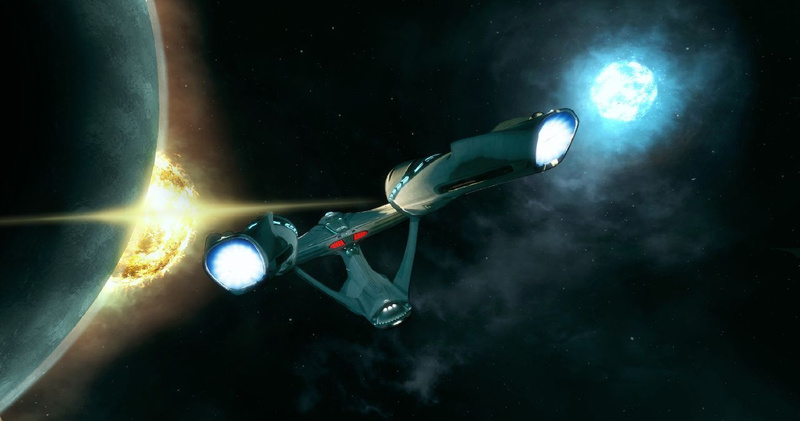 At first it looks, feels, and sounds like Star Trek – but not for long. Sadly, the authenticity is completely undone by the generic, cover-based gameplay that the title adopts. Star Trek has never been about pure action – favouring diplomacy and problem solving ahead of gunplay – yet this adaptation is bulging with energy weapons, shootouts, and knee-high crates, consoles, corners, and crags. The combat is passable when it's flowing, but it doesn't suit the source material in the slightest, and makes for a rote and predictable experience. Fortunately, the action is just about amplified by the banter between the passionate Kirk and the logical Spock. It is fun playing alongside a human counterpart, as you work together to turn hacked drones and turrets against your adversaries, and enhance each other's shields. These positives aren't enough to overshadow the title's cavalcade of problems, though. Outside of the bothersome combat, you'll find yourself engaging in irritating mini-game puzzles where you'll need to match sine waves, play a futuristic adaptation of Snake, and toggle the analogue sticks. Simple traversal sections break up the pace, as you scale structures, cliffs, or even take a swim – but it won't be long before you're back to the grind of shooting lizards in the face. And unfortunately, the foes aren't the only bugs on display. The floaty controls are particularly problematic, making accuracy an enormous issue. Meanwhile, invisible barriers extruding from cover areas deflect your shots, while the AI regularly gets stuck in corners and other scenery. Elsewhere, you'll be forced to observe repetitive animation loops and other visual oddities, such as the camera adopting a mind of its own, and characters actually getting stuck in its imaginary lens. The final nail in the shuttle craft, though, comes when your computer-controlled counterparts fail to complete objectives, leaving you with no choice but to restart checkpoints and try again. It all becomes a little too much to forgive, and makes playing the ten hour adventure a massive chore. 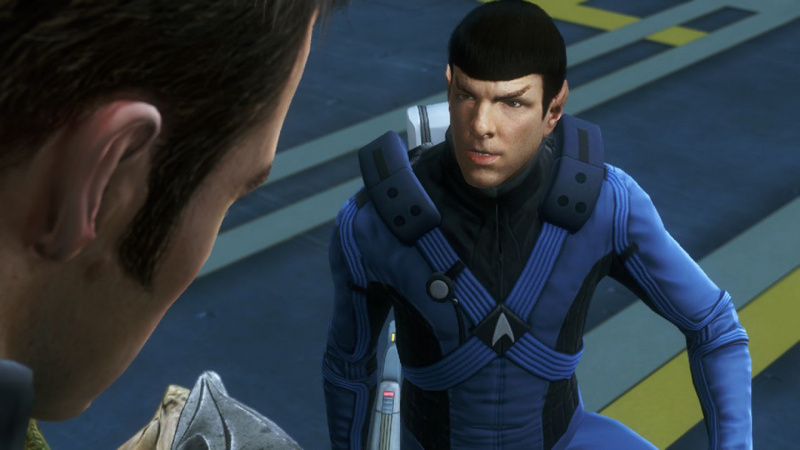 Star Trek: The Video Game shows signs of promise, and even manages to deliver a serviceable plot – but buried beneath its palatable dialogue is a calamitous third-person shooter that makes a mockery out of its source material. Fans of the franchise may be able to see past the bugs, but will despise the emphasis on action, while everyone else will be best served elsewhere. @Jaz007 It would still score poorly, though, because it sounds like it's a rubbish third-person shooter to boot! 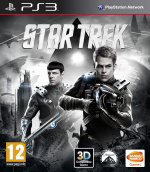 Been a fan of Star Trek for a few decades, so had high hopes for this. Will wait until it's dirt cheap. Excellent pun work there, Greg!